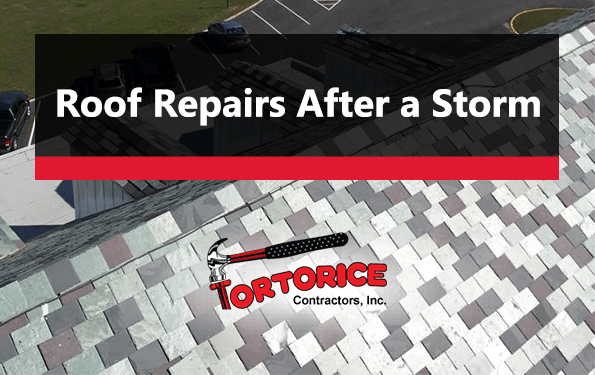 Pennsauken Township Roofing Contractor: Roof Repair After a Storm - Tortorice Contractors Inc. The eastern part of the United States is hit by plenty of storms each year. There are also areas that often see a large amount of rain. Powerful storms and incessant rain can cause thousands of dollars in damages to your roof. If your roof is leaky or gets blown away, water can come inside your house and cause damage to your interior. Regular maintenance can help preserve the construction of your roof and extend its lifespan. However, the weather can be unpredictable and you might want to keep these tips in mind if you need to check your roof after a storm. According to professional Pennsauken Township roofers, the first step you can do is to do a visual exterior inspection of your home. If you live in a wooded area, there might be trees, debris, and even power lines that could have damaged your roof. A visual inspection will give you a general idea of how extensive the damage is. There are other damages like broken gutters and overflowing downspouts that you can repair if you know how to. A visual inspection will also help you decide if you need the help of a reputable roofing company in the Pennsauken Township. If you’re tempted to go up to the roof and fix everything by yourself, proceed with caution because roofs are generally very slippery after a storm. It can be very easy to lose your footing when you’re checking for damage, and accidents can only worsen your problem. Water can also seep inside your roof and damage interior support. Also, if you go up to your roof without checking your interior support, you could end up with a big hole in your roof. Be sure to also check for broken shingles and roofing materials on the ground. This is a safer way to check to see if some parts of your roof will need repairs soon without having to go up on it. If there are broken power lines stuck to your roof, forget about going up on it. Call the local power company to report the damage and they will take care of it for you. Not only do they have the expertise in dealing with this type of situation, they also have the right equipment and have the authority to tell the electric company to shut off or turn on the power. Next, check the inside of your house for any leaks or wet spots on the ceiling. This is a sign of water seepage which is probably caused by holes on your roof. Another place you need to check is your attic. Some water might seep in and damage your insulation. If you spot leaks or yellow spots on your ceiling or attic, it’s probably safe to say that you need to call a roofing contractor in the Pennsauken Township for an inspection. Also be sure to check the drip edge and gutters. These are high water areas and can be damaged after a storm. When damaged, water can seep into your roof and ceiling and cause leaks and mold. This type of damage is usually caused by improper caulking or the use of a low-quality caulking by the roofing company. The roofer will most probably perform the same inspections as you do. However, they are also the right people to tell you if your roof can be repaired or if you need to have it replaced. Most roofing companies in the Pennsauken Township will check your roof inside and out and will be able to give you a detailed estimate for the cost of the project. Generally, an estimate contains the type of work to be done to your roof. It also includes the type of materials to be used, the equipment they will bring in, and a schedule for the work to be done. You should receive a written estimate a few days after the inspection from the Pennsauken Township roofer. If your roof has only suffered small damage, you can repair and clean your roof without the help of a professional roofer. Small jobs like removing debris, minor re-shingling, and other small jobs can be done by most homeowners. If you have experience performing these tasks, you can do them when the roof is thoroughly dry and the power company has removed any possible power lines stuck to your roof. Hopefully, these tips can help keep you safe during storm season. The best way to prevent leaky roofs is to have your roof inspected before the storm season starts. Regular preventive maintenance and inspections by a roofing company from the Pennsauken Township can greatly increase the longevity of your roof.